I'm a cat person. Anyone who knows me will tell you. Hell, anyone who has read my fiction can tell you, too. Only my odd little book I Was Someone Dead has a dog in it. Almost all my other books feature a cat in some kind of major role. Even my crime graphic novel. I don't trust dogs. My foundation for this? Because I was once told if I had a pet dog, he or she wouldn't eat me after I'm dead, whereas if I breathed my last here in the apartment, Sadie would feast on my corpse if she got hungry during the considerable wait before someone finally realized I'd succumbed. There is something more honest about that, I think. (Pardon me if I've used that line before...sometimes I can't remember if my jokes are ones I tell, or ones I've written down once upon a time.) Dogs are sneaky creatures. It's all about approval ratings. Their insistence that you must like them, that you will pay attention and be their friend, is their sneakiest move. It's like the pretty girl that gets you to buy her drinks and dinner, and then leaves without giving you her number; they know it will work, they know you will succumb. Cats let you know where they stand; dogs pretend not to be self-serving as a method of enslavement. And no, I'm not immune. Case in point: Boss. Boss is a pug who belongs to a friend of mine. That's him and me there. I'm the one with the shiny forehead. 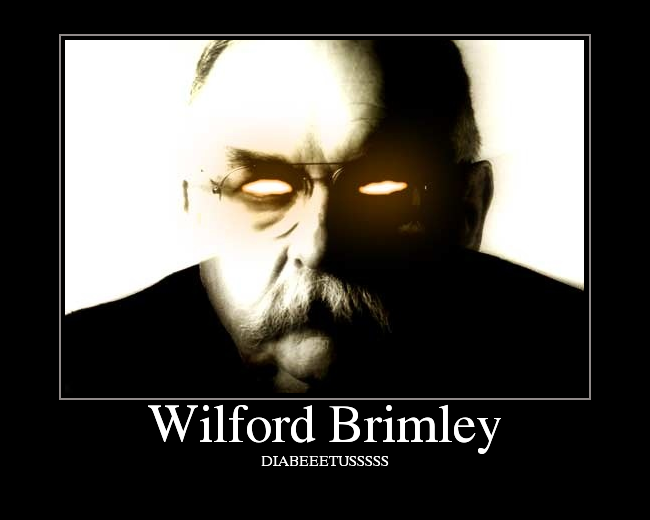 He looks like Wilford Brimley and goddamn if I wouldn't buy a bowl of oatmeal from that little jerk. People I know have seen me walking him in the neighborhood, and they usually do a double-take. My regular excuse is that he's a chick magnet (which is true, he is), but the real story is that he conned his way into my heart and we're pals. I even walked him tonight, jumped at the chance when my friend called and asked if I'd have time. Pet love is universal, regardless of the species. 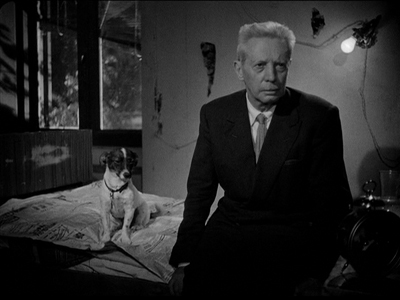 I am only on this dog tangent because Vittorio De Sica's 1952 drama Umberto D. is about an old man and his dog. Umberto Domenico Ferrari, as played by Carlo Battisti, and Flike, as played by Napoleone. Harlan Ellison wrote a famous novella called "A Boy and His Dog," about a guy who survives the nuclear apocalypse with his faithful pooch. 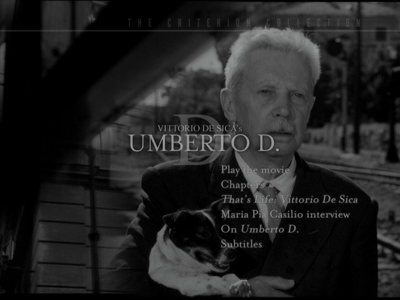 Though it doesn't have nuclear war or mutants, De Sica and Cesare Zavattini's script for Umberto D. is built on the same principle: man's best friend can make anything bearable. Old Umberto is a retiree who is having trouble making ends meet on his pension. Behind on his rent, he is at odds with his exasperated landlady (Lina Gennari), who is ready to kick her tenant of twenty years to the curb. Desperate to save cash and get ahead, Umberto manages to get a bed in the public hospital and weasel an extended stay. When he finally leaves, however, he returns home to find Flike gone and the rooming house being remodeled. Though he finds Flike again, he can't do anything about the fact that the walls of his tiny room are being torn down. Umberto needs another solution. Make a movie about a dog, and it's almost guaranteed to be schmaltzy. There's no quicker way to pull the heartstrings right out of their sockets than get a cute dog to look sad and whimper. 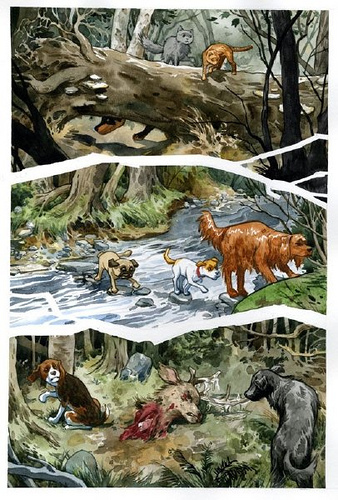 Beasts of Burden, a recent comic book series by Evan Dorkin and Jill Thompson, uses dogs and cats rather effectively to tell old school ghost stories, and I wondered while reading it if I would have cared as much about what was happening if they had used humans instead. Their furry monster fighters came without the human baggage, and the quick emotional connection I made to the characters made the spooky stories all the more harrowing. Is it possible that slasher flicks have immunized me so much, that had the legion of ghostly puppies in the second issue actually been the specters of a bunch of dead kids, I wouldn't have gotten as choked up when they cried for justice? 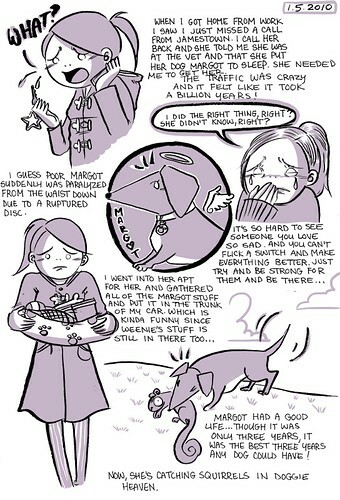 Put a story about a pet in the hands of accomplished artists, such as Dorkin or Thompson, and they can manage to tell a sentimental yarn without making it overly sentimental. I know that sentiment is an icky thing in most critical playbooks, but it's kind of a fake pose. Sentimentality is not inherently evil unto itself. Like most things, it's excess that makes sentimentality bad, or going straight for the easy tears without really earning it. You're not going to find a more delicate hand than that of Vittorio De Sica, particularly at this stage of his career. 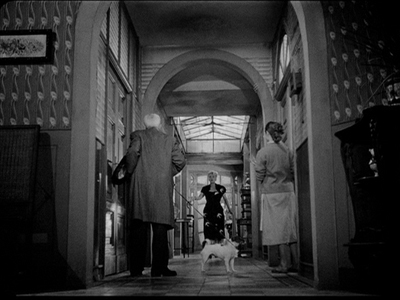 It would have been easy to go over the top with any number of scenes in Umberto D. The old man looking for his pup at the pound, for instance, the way he sees other dogs being wheeled into the abattoir--this could have been an awfully trite sequence in any other movie. De Sica, in his quest for naturalism and adherence to the Neorealist credo, underplays everything. When an event is as naturally dramatic as this one, there is no need to pile anything on top of it. Working with a combination of non-actors and seasoned professionals, De Sica creates a world that resembles reality yet toys with the idea of performance. Sensing there is already a natural divide in his story, that between the poor people like Umberto and the maid Maria (Maria Pia Casilio) and the ones with money, such as the landlady, the director playfully adds artificial divisions, as well. The landlady, for instance, sits in her boudoir analyzing music with her snooty friends--they are all performers, or at the very least, wannabes--and she is going to move up in the world by marrying a cinema owner. Miniature soap operas play out in her social circle, as well, like the two lovers Umberto and Maria spy through the keyhole. How far away the cheating wife's predicament is from the more critical crisis of the maid, who is pregnant, unsure of who the father is, and convinced that she will lose her job once the landlady discovers she's with child. It's all these tiny dramas that make the world of Umberto D.. Whole lives are being lived in stairwells, whole stories being told on the street. The cheating wife shows up more than once, ashamed and nervous to be seen by the old man who knows her secret (even if he barely seems to remember; his spying on her through the keyhole has a sort of visual rhyme in us spying on him through the gaping hole put in his wall). There are the tales the beggars tell to manipulate passersby into giving them money (stand-ins for those falsifying, overly sentimental filmmakers, one could say), and there is even the political foundation De Sica lays at the start of the picture. Umberto is one amongst a crowd of old men who have taken to the streets to protest unfair pension policies, only to be chased by policemen in jeeps. The world is unfair and uncaring. 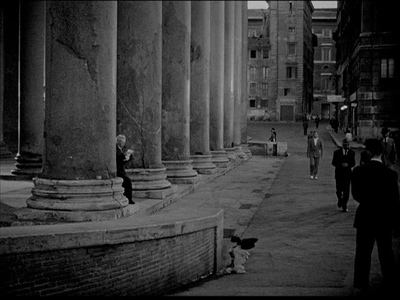 The ornate, towering city in ruins buries its older citizens, makes them small (particularly the way De Sica frames them). Carlo Battisti plays Umberto as a quiet, proud man. He is a man who wants to raise his fist in the air and shake it, but he's more likely to do it standing behind a door than out in the open. The only time he really gets heated up is after he finds Flike again, and he confronts his landlady to her face. Flike is the one thing he cares about, and that's because he knows Flike cares about him. 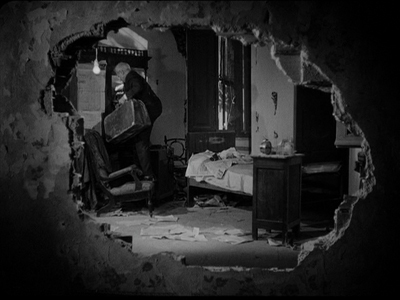 The third act of Umberto D. takes a dark turn, when Umberto's despair becomes so great, he considers ending it all. The only thing stopping him is the dog. He can't leave Flike without someone to care for him. He considers boarding the animal but doesn't like the look of the lodgings. He tries to give Flike to a little girl, but her nanny reinforces the notion that modern society is cynical and uncaring, she believes there must be a catch. Umberto tries to run, but Flike finds him. This relationship puts me in mind of my father and his relationship with his dog Shep. 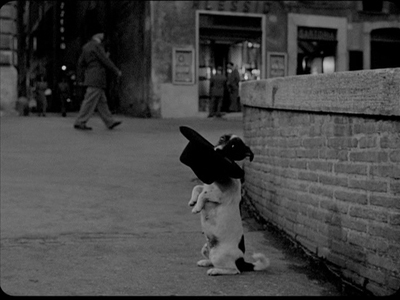 It's actually in tribute to that friendship that I put the dog Gus into I Was Someone Dead; it may be no small coincidence that Vittorio De Sica dedicated Umberto D. to his father. No one else in my family really liked Shep. He was an Australian Shepherd, a slightly large dog, and too dumb to realize his own size. He was also usually pretty filthy. My dad loved him. As he explained it, Shep never cared what kind of day he had, what he did or did not accomplish, the pup always greeted my pop the same way whenever he got home. 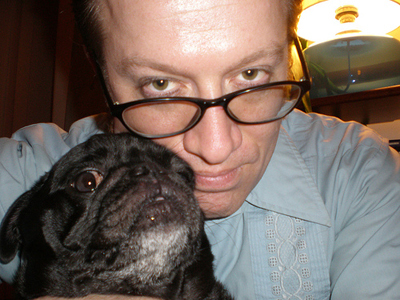 Eventually Shep got sick and had to be put to sleep, and my father, who has not always been prone to personal expressions, still tears up more than ten years later when he talks about having had to make that decision. You'd be hard-pressed to get a single drop out of him in regards to an ex-wife. There is nearly half a century between Shep and Flike, but again, such is the commonality of having pets. Flike gives Umberto a reason to go on, and his friendly, nonjudgmental gaze compels Umberto to maintain his dignity. Innocence is a mirror in which we see our own guilt. At one point, Umberto considers panhandling, but he can't bring himself to carry it through. Instead, he has Flike sit on the sidewalk holding his hat. When someone they know comes by, I get the sense that Umberto is more ashamed that he made Flike do his dirty work than he would have been had the colleague caught him begging on his own. 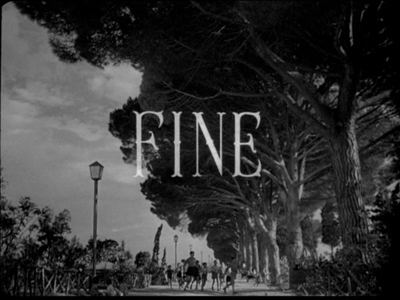 When it comes down to it, the relationship between Umberto and Flike is a replay of the relationship between the father and son in De Sica's Bicycle Thieves. In both, daddy is going to have to do some bad things that he wishes his child was not around to see, but he can envision no other option. The difference here is that the child does not have the capacity to protest or for the most part even understand what is wrong. This makes it all the more gutwrenching when Umberto makes a decision that actually affects the animal, so much so that Flike runs from him and is reluctant to let his old pal back into his good graces. It's another mini drama, but this time with the central characters, a micro narrative that provides Umberto the way to redemption. It's Abraham and Isaac, but Isaac is both the sacrificial lamb and the angel that stays his master's hand. Flike gives in kind of easy, if you ask me. A cat would have held out for much longer, made the old goat suffer, and then got a special treat out of it, sentimental finales be damned. Yesterday's EmiTown was coincidentally appropos of this topic. Well, this is awfully late to comment, but having just watched the film (again), I happened across your piece--which is excellent. But you don't know spit about dogs. They aren't pretending to care about us. They're different from cats--they're pack animals. They need family. It can be their own kind, or some entirely different animal--like us. I don't know what it is about cat people that they need to find some way to disparage dogs, even if they like some individual canines--dog people, in general, have no such compulsion. I admire the hell out of cats, but dogs were our first friends--they didn't just get treats out of us, they protected us, often at the cost of their own lives. Because they saw us as pack members. And they still do. They can be selfish, but can't we all? What's so dishonest about them acting as if they like us, when they really do? Cats PRETEND not to like or need us, when they really do. They're the ones that are hiding their true feelings--Umberto is like a cat for most of the film--at the end, he becomes like his dog, living joyfully in the moment, and that's the transformative moment. If Umberto had a cat, the cat wouldn't have come to find him after being abandoned--c'mon, you know that. He'd go off and hunt, or just go back to the house he considered home, and to hell with the stupid landlady. You couldn't do that final scene with a cat. It wouldn't work, on any level. There's a far schmaltzier final scene with a cat in Breakfast at Tiffany's, but you've seen that, right? It must have been hell just getting that cat to stay in one place. That cat is just barely resisting the impulse to scratch Audrey Hepburn's eyes out. "I'm wet, and I'm miserable, and what the hell is going on here? My agent is going to hear about this!" But the trained canine actor Napoleone comes to look for Umberto--obviously they had the non-actor actor spend time with him, and he's playing a game of hide and seek with his new friend. It's so real, so unforced, what happens between them--the dog doesn't understand the story being told, but he's genuinely interacting with the people. It's all a game to him (and of course he got treats, just not on-camera--what's Umberto going to give him? They're both probably going to starve, you know). As an animal lover, you correctly see why Flike is so important to the story. But as a cat person, you still feel the need to say "dogs are stupid liars", and they're not. They definitely get the short end of the stick in our little arrangement, but that's our fault, not theirs. In the context of the 1952 time period in Italy, what is the definition of the dog's name "Flike"?